What an amazing vintage of our classic Napa Valley Sauvignon Blanc! 2012 was ideal for growers and we are luck to capture 390 cases of this current vintage. Stone fruit, melon, a touch of citrus. Balanced acid. It is a perfect wine to enjoy all spring summer and fall! The 2012 growing season was one for the record books. 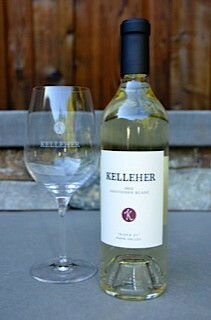 We could not have asked for more perfect conditions and this makes us even more excited to share with you our newly released 2012 Kelleher "Block 21" Sauvignon Blanc. The aromas are dominated by tropical notes, as well as a hint of stone fruit and melon. Aging was done in 90% stainless steel barrels and 10% used French oak and we find that this combination really enhances the fruit from this St. Helena vineyard. Crisp and clean and in perfect balance. The fruit forwardness is enriched by the depth that battonage imparts on the wine. Aging 3 months in 90% Stainless Steel and 10% used French Oak. Vineyard Notes 2012 was one of the best growing seasons on record. From bud break to harvest the weather was ideal. The fruit for our Sauvignon Blanc comes from a organic, dry farmed vineyard in St. Helena.